Do you want a new job or career but have some of these challenges? 2) Your aren’t sure how resumes are written today. Maybe you have looked at some resume book that have a dizzying array of styles, or you’ve gotten conflicting advice from colleagues or friends. 3) You aren’t sure how to submit resumes online or via email, or if you should still send them via the mail. If you see yourself in any of these scenarios, take heart. You’re not alone. Most employees have faced a similar daunting task when faced with getting a resume written and mailed, emailed or submitted online to an employer who is hiring. Today, many professionals hire a resume writer who will spend 5-12 hours interviewing them and then creating a well-written, powerful and targeted document. I know. I’ve done it for years, writing resumes for clients in the U.S. and internationally. And charged about $500/resume. But you can do it yourself! For almost 10 years as an outplacement trainer for a major career international transition company, I’ve taught laid off employees how to write their own resumes. I can teach you too. I’ve assembled an easy workbook completed with audio instruction from me. It’s just like taking a class with me. You work at your own pace, when it’s convenient. You build YOUR resume, the way it works best for YOU. Filed Under: Is this you? Admit it: you want your resume completed…NOW! It’s your ticket to writing a top-notch professional resume you’ll use for the rest of your career…for each new job. And the best part is that you do it yourself! Even if you never knew where to begin – or tried and didn’t finish – now you can completely write your own professional resume easily and quickly. There’s an alternative to hiring a professional resume writer, or resigning yourself to a resume poorly written by you or a friend. When you buy the Resume Writing Boot Camp you will learn step-by-step how to write an easy-to-understand and easy-to-use Business Resume. It’s a process you’ll use throughout your future career changes, using well-developed strategies and actions. You aren’t sure how resumes are written today. Maybe you have looked at some resume book that have a dizzying array of writing styles, or you’ve gotten conflicting advice from colleagues or friends. You aren’t sure how to submit resumes online or via email, or if you should still send them via the mail with the cover letter. But you can do it yourself! For almost 15 years as an outplacement trainer for two major career international transition companies (DBM and RiseSmart), I’ve taught laid off employees how to write their own resumes. I can teach you too. I’ve assembled an easy workbook completed with audio instruction from me. It’s just like taking a class with me. You work at your own pace, when it’s convenient. You build YOUR resume, the way it works best for YOU. 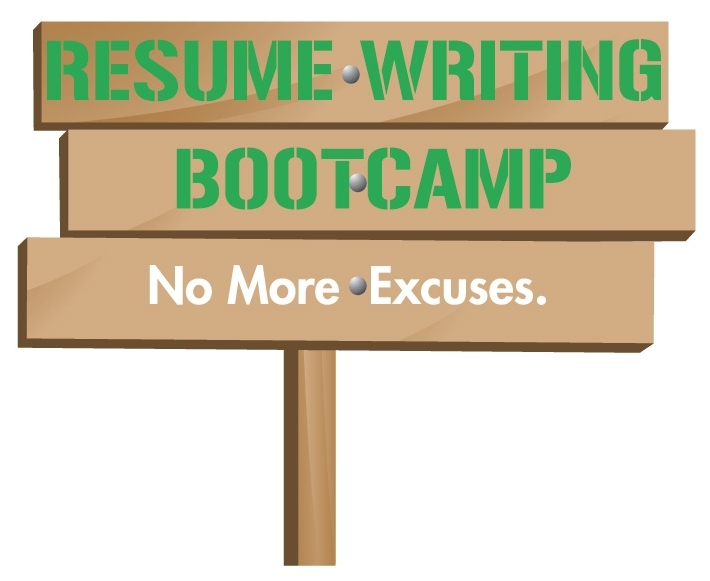 Check out what’s included in the Resume Writing Boot Camp! “OUCH!” Is Your Resume Hurting You? Click here to find out! Many people believe that having a resume—any resume—is better than not having one at all. This is based on the belief that a resume is a relatively simple document, and that they are easy to put together. Resumes look fairly simple, but when you dissect the really well-written and effective ones, they are very carefully crafted and condensed advertising documents. So how do you know if your resume is hurting you and your future career chances? Find 10 local job openings you are qualified for. Send out your resume and apply for the jobs. If you do not hear from the employers, then your resume is most likely NOT doing its job. Yes, this is a simple test! However, it works because the only job of a resume is to get you interviews for jobs you are qualified for. Bottom line: If you are not getting calls for interviews….the prospective employer simply can’t tell from your resume that you are qualified for the job! In our next session, we will discuss more ways your resume can hurt you by uncovering many of the “myths” job seekers have about resumes. These “myths” cause people to have poorly-written or targeted resumes. In the meantime, if you answered, “YES! My resume is hurting me…I’m not getting calls for interviews,” then TAKE action! You just purchased the Resume Writing BootCamp Super Kit! So get moving to develop a powerful resume! 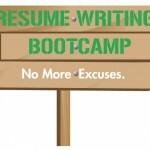 The Resume Writing BootCamp Workshop audio file links. You can listen to them on your computer, or download to your IPO or MP3 player to listen to while working out, driving, or wherever you choose! Our proprietary 39-page workbook in Microsoft Word format. Step-by-step assignments that work with the audio files are designed to have you complete your resume in easy phases. You’ll receive your “Resume Sample-Builder” workbook with resume samples and templates. Laid out in “bits and pieces” it’s designed to help you pick and choose tactics that will work for YOUR unique situation. Stay tuned for tomorrow’s lesson and that will help you get going and develop a plan to get it done. Part 2- OUCH: Is Your Resume Hurting You? In this E-course session we’ll examine what some of the common mistakes that people make when writing resumes, and how they can hurt you. To recap, we determined in Part 1 that your resume is hurting you if are sending it out and submitting it to jobs you are qualified for, and you are not getting calls for interviews. Resume “myths” can hurt you because they influence how your resume is written, and ultimately what the prospective employer will learn (or not learn) about you from it. Remember that a confused mind will always say “no,” so if your resume does not meet the needs of the employer, you will not be called for an interview. Myth #1: Your resume must only be one page in length. Resumes continue to evolve in style, content, layout and focus. Your father’s resume from the 70’s is not the resume you should be presenting today. When someone tells you that your resume must be one page, ask them “Why?” They will most likely reply that most employers won’t read more than one page. Well, it is true that employers don’t read resumes—they SKIM them. And they are skimming them looking for your accomplishments that match up with the needs of the open position. By eliminating key accomplishments you can be certain they cannot match you with their needs. Additionally, the “one page only” rule began in the 60’s and 70’s when employees only needed one page. Think of all that has changed: people now change jobs 5-7 times, versus maybe once in a lifetime. We’ve added email addresses, cell phones, graduate schooling, multiple continuing education, certification and training classes; volunteer and leadership positions in many volunteer, professional and civic organizations. How could anyone cram all that into a meaningful one page? Myth #2: If you do not know what you want, create a general resume so you can be open to lots of different types of jobs. Would you hire a generalist as your hair stylist? Someone who has had four different careers, one of which was a short stint in hair styling? Or, would you rather hire someone who presents herself as a hair stylist, conveys her passion for her field and is very focused in her goals? You would probably prefer to hire the professional rather than the dabbler. A general resume is just that, “general”. 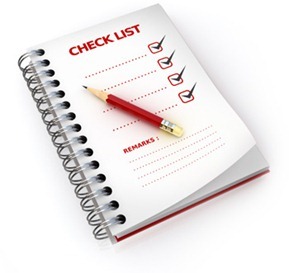 It focuses on things you have done in your career that YOU think are important. You’ve missed the point. Resumes answer the question of whether you have unique skills for a specific position. By trying to do all things for all people, general resumes end up not showing expertise in anything. If you do not have a specific job and/or industry target, then you are not ready to write a resume. Myth #3: Employers actually read the resumes they receive. After all the hard work you put into your resume, you’d like to think that everyone gives your resume the same love and care you gave it. However, the reality is quite different. A study was done in H.R. offices where the incoming resumes were counted, and the reviewing time clocked. The result was that employers only give your resume between 8 and 15 seconds. They don’t read it, they SCAN it. And so your resume should be formatted and written to tell them what they need to know. No more. No less. These are 3 of the Top 10 Resume Myths. If you would like to read the other 7, they are contained in the e-book, “Resumes Done Right Factbook”, part of the Resume Writing BootCamp Super Kit. See below for instructions on how to purchase.